If you have read the book and would like to participate, you can add comments to any of our pages or to the Literary Wives Facebook page. Let’s get right to the book! 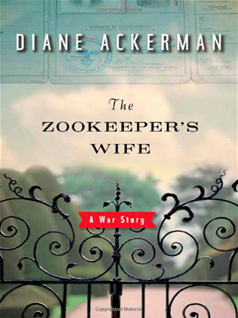 The Zookeeper’s Wife tells the true story of Jan and Antonina Zabiński, the keeper of the Warsaw zoo and his wife during World War II. After the bombardment by the Germans and their invasion, the Zabińskis struggled to keep the zoo animals alive, but they were also responsible for providing temporary shelter in the zoo grounds and in their house to hundreds of Jews. Jan, who was a member of the Polish Underground, found ways of smuggling people out of the ghetto, and he and Antonina kept them at the zoo until they could be placed elsewhere, sometimes for a few days, sometimes for longer periods. The book is rich with details about life in their unusual household, full of animals and of hidden people who came out cautiously at night. It tells stories of lucky escapes and frightening encounters with the Nazis. It also provides information about life in the ghetto and some of its heroic leaders. I found some of these stories extremely touching, such as that of Henryk Goldzmit, a children’s author who went by Janusz Korczak. He abandoned his literary career to found an orphanage for Jewish children, and when the Nazis decided to ship all the children to Treblinka and almost certain death, went with them so they would not be frightened. Although some of Ackerman’s many digressions from the main story add interest and color to the book, I unfortunately found others disruptive to the flow. For example, she spends more than a page on Jacques Offenbach simply because Antonina played one of his pieces on the piano to warn the hidden residents when strangers approached. Ackerman, a nature writer, spends another very long paragraph just listing the types of bugs in an insect collection entrusted to the Zabińskis. After awhile, these digressions began to feel like padding. I also felt that Ackerman’s writing sometimes verges a little too closely on fiction. She is prone to rather florid descriptions of things she can only be imagining, often including inapt or odd metaphorical language. Although she introduces the book by saying she got the dialogue directly from Antonina’s diaries, she fictionalizes other things, such as the thoughts of sculptor Magdalena Gross, that could not have come from her sources. This style of writing for a nonfiction subject makes me uncomfortable. In fact, I read this book when it first came out and remembered it as a work of fiction. What does the book say about wives or the experience of being a wife? It is interesting to me that Jan Zabiński describes Antonina at one time as “just a housewife,” because she is clearly so much more than that. She helps him administer the zoo and take care of the animals even before the war. During the war, she takes care of a household of refugees while Jan is out until late most nights and is gone for some extended periods of time. Although he is described as authoritarian and occasionally harsh, he trusts her implicitly to run things and keep everyone safe, even through scary encounters with Nazi officials and drunk soldiers. Although she would define herself as a wife and her husband as the master of the house, it is clear that the two respect each other and trust each other to handle difficult and dangerous situations. Antonina also defines herself as a mother, with the fierce determination to protect her children and her other charges. You’re right — sometimes the prose here does come across as “fictional.” It made me uncomfortable too, as if the author felt the facts weren’t gripping enough in and of themselves. Good point, too, about Antonina as a mother — I think she was more defined by motherhood than wifehood. Yes, it didn’t seem as if Jan was around very much, and when he was, he was critical, as several pointed out. Ackerman is a nonfiction writer, but she certainly sounds likes she writing fiction and very purple fiction at that, as you pointed out! Although the reviews on this book are not glowing, I think that it’s good that the story itself is getting recognition. Jan and Antonina showed such great courage by doing what they did, and I wish it could have been written about in a way that more people can enjoy. Sure, another good point. As one of the “wives” commented, maybe it would have been better in the hands of a different author. You are so right about the disruptive flow. And you’re too kind to call it “rich” detail. I found it annoying. I kind of wonder if the lists and such annoyed me so much because I listened to it. With reading, you can skim or move quickly through that stuff, but with listening it felt like it would never end and I got sleepy! I can imagine! Especially the list of beetles! I don’t remember any others, but I wasn’t listening to it, so I probably just skipped over them once I realized what she was doing. What I found more annoying was the language she used sometimes, the metaphors that really didn’t seem to work very well. Oh, I think the audio definitely made it worse for you. I skimmed A LOT. It was the only way I was able to get through the book. I admit to skimming a bit myself, especially the lists. I’ve been trying so hard not to look at your posts all day until after I had written my own. Once again I find that I’m too soft on these books. 🙂 I really liked it and enjoyed many of the historical digressions. To me, those just made it more real and gave me more context. But I do agree it often felt like fiction. I didn’t mind so much because I prefer reading fiction, but I wouldn’t go to this book if I needed hard facts about Antonina’s story. I prefer fiction, too, but I think we’re treading a dangerous path when people think a nonfiction book is fiction. Also, how can we trust what she says when so much of it is obviously from her imagination? I will have to go look at your post now. You aren’t too soft on the books, Ariel. One of the interesting things about book clubs is the disagreement, and the conversations it provokes. Yes, we all have different backgrounds and different things we look for when we read. I am frustrated by another (ground-based) book club I belong to, because one or the other members will have expressed strong feelings about the book to me personally (often dislike), but then in the discussion, they don’t say anything, or their comments are much more positive, maybe because they’re afraid to be impolite. I truly believe that if you really like or really dislike a book, you should say so in a book club, because that opens up the discussion so much more. I really feel I am learning and growing through Literary Wives; in the beginning I was so nervous to like a book that others disliked and vice versa. But seeing how respectful everyone has been has been a huge help. The best thing is that I get to see something that I couldn’t see on my own. It’s too bad about some of the members in your club. Just agreeing on everything defeats the whole point of a book club discussion! I’m so glad you mentioned Korczak’s selfless action/sacrifice! His story was certainly one of the most poignant to me. We certainly agreed about Antonina’s courage and bravery! Although I didn’t experience any disruption to the flow of the text as you and others have mentioned, and found the scientific information enthralling, offering yet another perspective from which to consider the Holocaust. And I’m so glad you noted Antonina’s own references to her role as mother! You’ve made me remember so many important aspects of this book, Kay! Thank you for that! Thanks for your comments! I’m not sure I got an email mention of your posting, Lynn. I’ll have to double-check to make sure I looked at yours. If I already replied to it, just consider this a senior moment! That’s an interesting point, that you felt as though Ackerman’s writing was so close to fiction. I wonder if that is why this was a difficult read for me – that it felt like it was both fiction and non-fiction…I don’t know. At times it felt like fiction and I came to expect it, but then there were all these facts. I thought it was very telling that at least two different members thought the book was fiction at first, and I remembered it as being fiction from reading it four or five years ago. I don’t think there should be such confusion with a nonfiction book. Right! I have a coworker who is in the club, and she’ll come into my office and say “I hate this book!” Then she comes to the meeting and doesn’t say much of anything. Maybe I should say something like “You told me you hated the book,” do you want to say why? But I started out the founder of the club, and I’ve been trying to get the others to take more responsibility, take turns leading the discussion, etc. So, I feel like saying things like that would defeat what I’m trying to do.